Just above the strand-line on the foreshore. With Sea Rocket just behind. 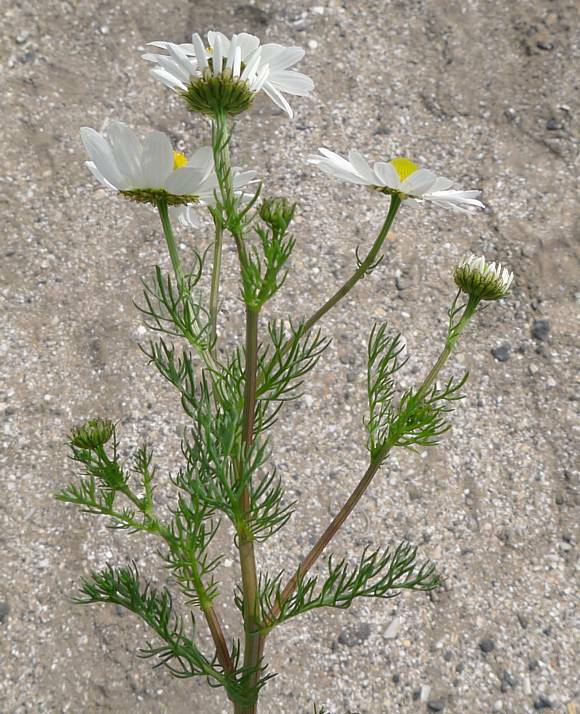 Un-like Scentless Mayweed , which looks very similar, Sea Mayweed is almost always confined to the coast, and more often than not on or near the highest drift-line or in the spray-zone on the sea-walls and sea-cliffs. 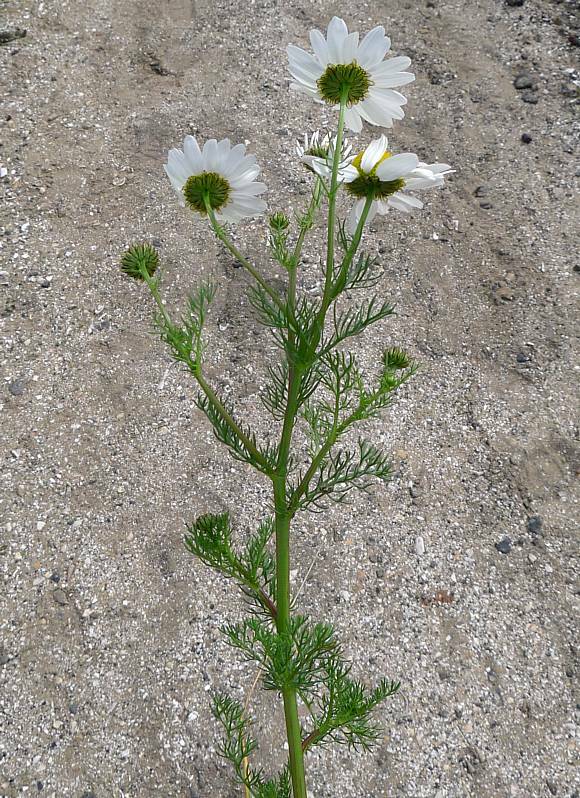 It is a Halophyte, able to tolerate salt as are many plants thriving near the drift-line. Inhabits shingle and other bare places near the sea. 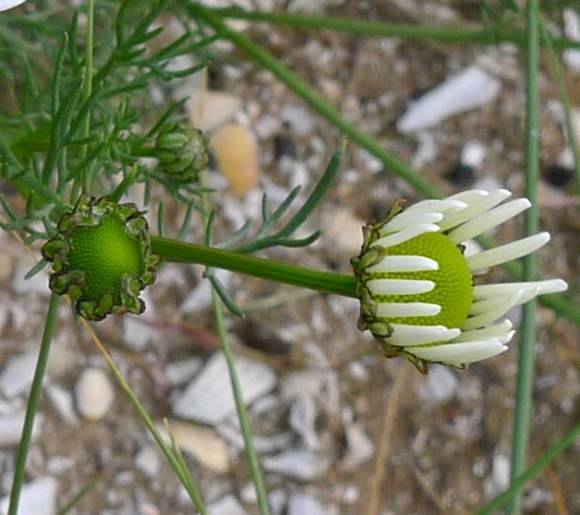 There is significant variation in the morphology of Sea Mayweed regarding stems and leaf thickness. 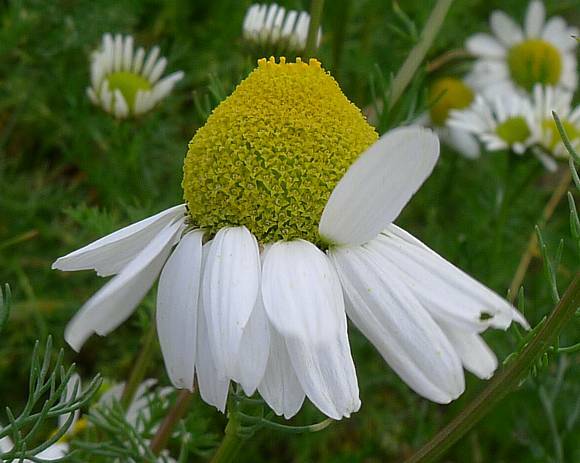 Sea Mayweed is usually stouter and spreads further than does Scentless Mayweed . Flowers a large 30 - 45mm across, leaves fine and feathery. 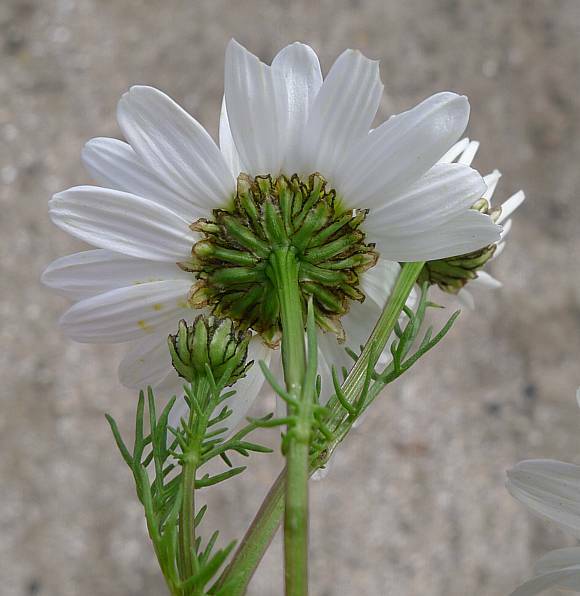 Stems grow to 40cm and are sturdy and branched, with branched and wiry leaves. 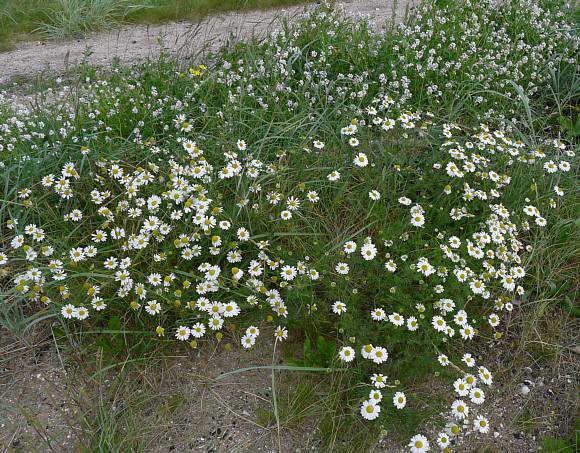 White ray-florets surround a dense cluster of yellow disc-florets. 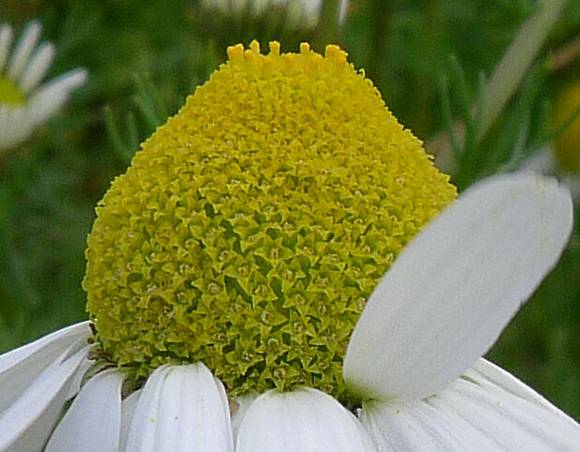 Disc-florets form a hemispherical dome. 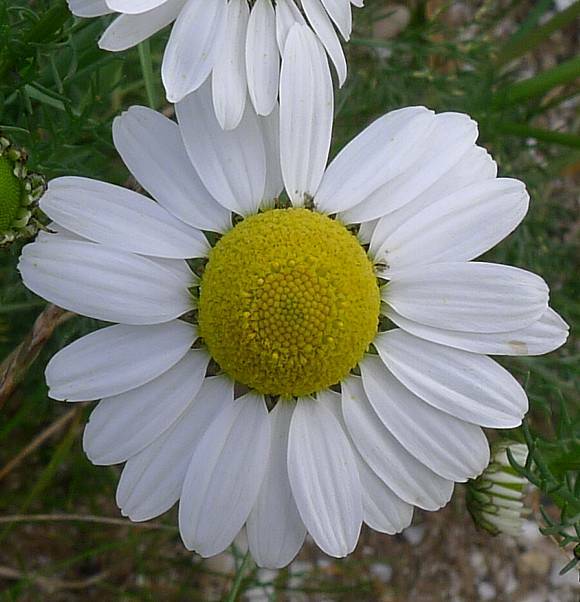 Ray florets often swept backwards slightly. 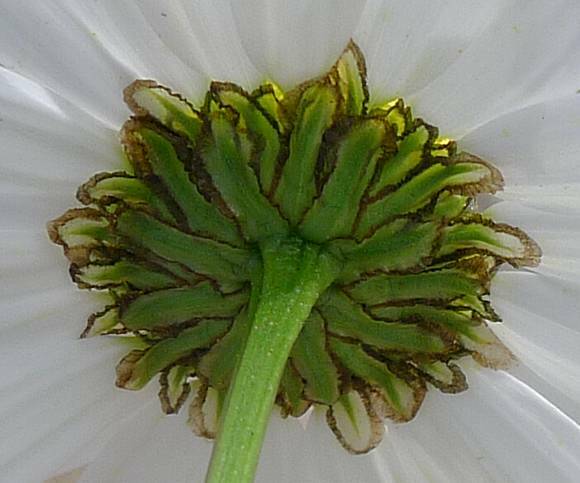 About 20-30 fairly broad oval white ray florets, and a dense mass of yellow disc-florets in the centre. 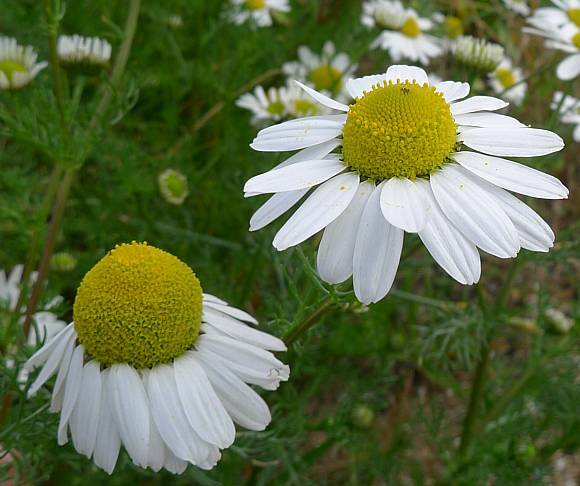 Sepal-like bracts are brown-edged and semi-translucent as are those of Scentless Mayweed and Corn Chamomile, but not those of the similar Scented Mayweed , Stinking Chamomile or Chamomile . Leaves many branched and wire-thin. 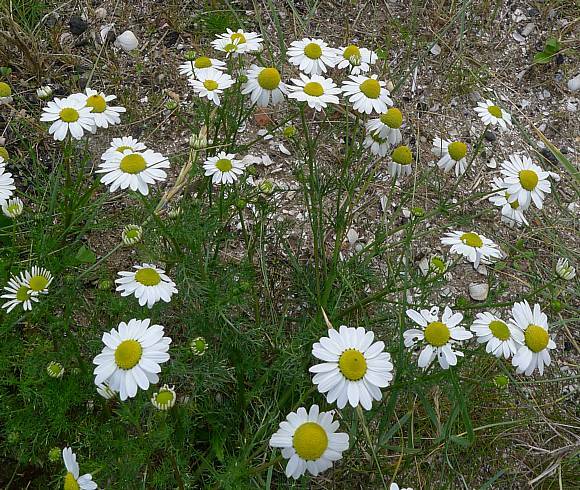 Stems often purplish, un-like those of Scented Mayweed . 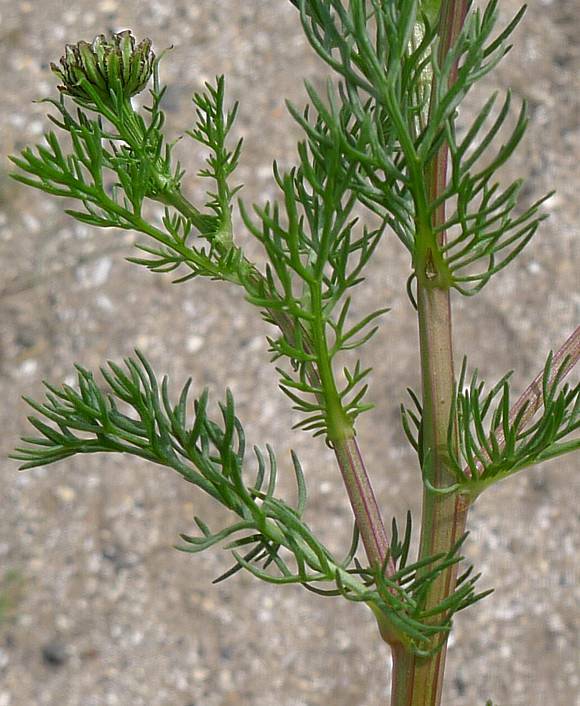 Stems sturdy, variously square or angular with purplish edges. Leaves adjoin the stem by a flattish almost succulent stem that gradually tapers and branches, the branches also being branched. 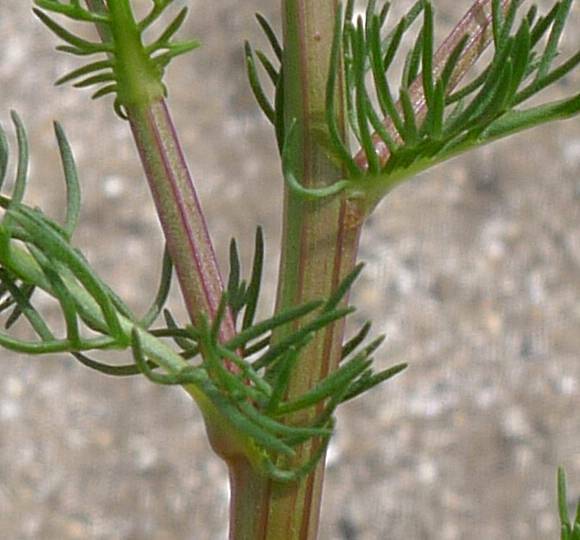 Leaves join the main stem wrapping itself about half-way around that stem. Flower buds in various stages. 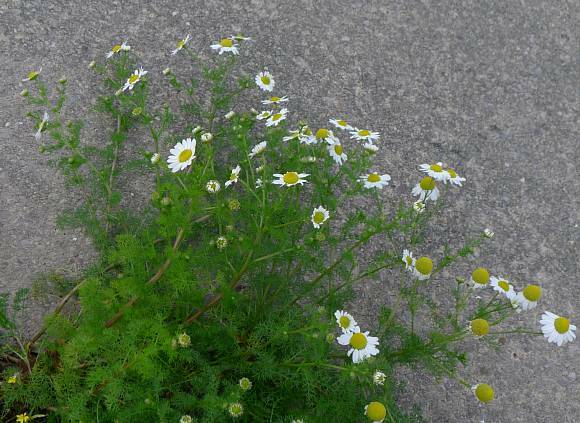 Easily mistaken for : Scentless Mayweed [see captions]. 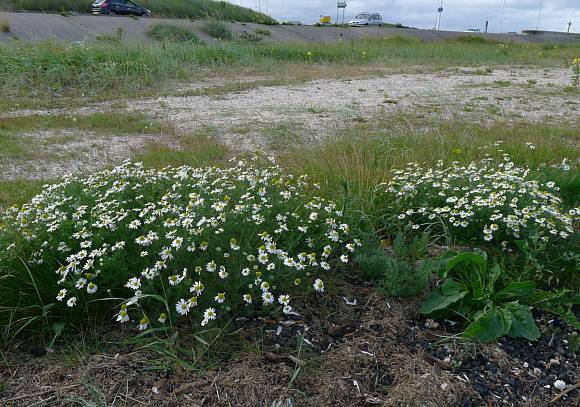 Hybridizes with : Scentless Mayweed (Tripleurospermum inodorum) to produce Tripleurospermum maritimum × inodorum but which occurs in only very few hectads, none around the Sefton Coastline. 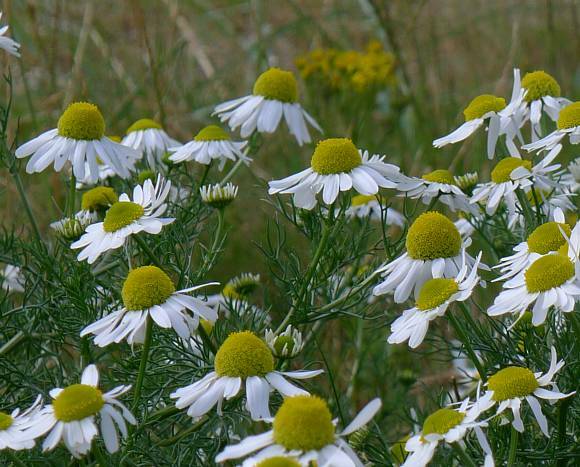 Chamomile (Chamaemelum nobile) which is fairly rare. but many of the above are odorous or perfumy, or do not grow next the sea. No relation to : May Apple (Podophyllum peltatum) [a poisonous plant with similar name that is not native to the UK].